The classic game of Yooyuball is back in this year's Altador Cup. Pick a team to represent, play games to rack up points, and help your team get a chance to win annual Altador tournament. 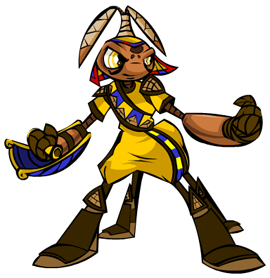 Stick with JN for all of your AC updates along the way! July 6, 2010, 2:26 pm NST - Congratulations Team Lost Desert! The Altador Cup V Cup winners have been announced! Lost Desert takes the cup, Team Kreludor comes in second and Team Darigan Citadel in third! The prize shop is now open, and you can go spend your hard earned prize points! You will also earn a new trophy for your userlookup. All prizes and trophies are listed on our prize guide. Also a congratulations to Twitterpate for winning the TNT Staff Tournament. You can claim your prizes for the final round. July 4, 2010, 8:13 am NST - After a long period of no results posted, it seems the finals are back underway, though no one knows if the lost time will be made up when TNT gets back from the holiday. In the Consolation Bracket, Team Moltara and Team Altador are still battling it out for ...not-last-place ;). In the fourth bracket, Faerieland and Kiko Lake will compete for 15th place, while victory in the lowest bracket is between Brightvale and Mystery Island. In the third bracket, Team Haunted Woods vs. Team Shenkuu will decide 11th place, and the winner of the third bracket will be determined by Terror Mountain vs. Tyrannia. In the second bracket, 7th place is between Meridell and Krawk Island, while a not-so-shabby 5th place is between Maraqua and Virtupets. The top bracket has been very close this year, with teams jumping from 4th to 1st almost every day. Kreludor are in first at the moment, just as they were last year. It's been a weaker year overall for Kreludor though, but it's important to remember that round robin is not equal to finals. Kreludor is proof of that, with last year's flop during the last four days. Kreludor aren't likely to let the same happen twice though, and that could make them a real contender this year. Narrowly behind them is the Lost Desert, my old team. It's been a fantastic year for the Desert, but we've begun to drop a little towards the end of the round robin. Hopefully we can bring it back - we were certainly a popular prediction for winners in the pre-cup season. Darigan Citadel sit in third, which came as a surprise to many. The Citadel has re-affirmed their status as a powerhouse this year, and the Lost Desert will certainly face a challenge against them in the first match of the finals. With Roo Island and Meridell, Darigan Citadel currently have the most Yooyuball wins, more than both Kreludor and the Lost Desert. Speaking of Roo Island, they are currently in 4th. It'll be a tough match for the former champions against Kreludor, but Roo Island's current standing has shocked many - so anything is possible. The results from the round robin are inconclusive, with one team winning in each round. Moving into the second bracket, Meridell sit in 5th, after a bitter struggle with Roo Island for 4th. Meridell currently seem far stronger than the other teams in the second bracket, so they should be able to hold on to 5th. However, the Darigan Citadel were in the same position last year, and ended up falling. Meridell should be working hard to make sure history does not repeat itself. In 6th, Krawk Island are currently on track to be the highest ranking winners to date. However, a drop of even one place will take that title away from them, and the other two teams in the second bracket are very close to them. Virtupets, now in 7th, will be facing Krawk Island. Virtupets is definately this year's surprise. After last year's impressive, but ultimately futile Shootout Showdown mastery, Virtupets have changed tactics and have managed a lot of Yooyuball wins. Lots of people are underestimating them, but they could well turn into a dark horse of this tournament. Maraqua sit at the bottom of the second bracket, though during the cup they have been at the top. Against Meridell, it seems an unlikely struggle, but Maraqua has managed such upsets in the past, including during last year's finals. The third bracket is where things start to get a little more spread out this year. The Haunted Woods are at the top in 9th, clear leaders in the group. Though, that's no reason to grow over-confident. The other teams in the third bracket haven't exactly been pushovers during the round robin. Tyrannia are in 10th, a curious quirk in the standings considering they have minimal Yooyuball wins. Side games are what have boosted Tyrannia in the standings, with the highest Slushie Slinger record this season. It will be Yooyuball that matters the most in the finals though, so Tyrannia will have to switch their specialty. Behind them in 11th are Shenkuu, this year's major disappointment. After 2nd place last year, Shenkuu just hasn't been able to replicate. With a stronger Yooyuball record than Tyrannia and Terror Mountain, Shenkuu could be looking at 10th position if they put in a little more effort. Terror Mountain, the final team in the third bracket in 12th, have taken over Virtupets's Shootout Showdown mantle from last year. They were unbeaten for much of the cup, and prove once again that a side game doesn't give you an advantage in the standings. In fact, Terror Mountain currently sit in the place Virtupets were in last week. It seems unlikely that Terror Mountain will make a comeback at this stage, but stranger things have happened. Brightvale, after an early show of strength, sit in 13th position at the top of the fourth bracket. Brightvale will certianly have to fight in order to keep that position, as a few teams in the bracket are capable of sizable upsets. Mystery Island is one such team, currently in 14th. They have managed upsets over many teams in the cup, including the Lost Desert, but their changable nature has shot them in their foot. If they pull it together for the finals, they could be 13th. If not, well 16th could be heading their way. Kiko Lake has managed to hold its own against bigger teams, though only really in Slushie Slinger. It is perhaps for this reason that they sit in 15th. It seems unlikely they will fall, but a rise will certainly have to be fought with everything they can muster. Faerieland sit in 16th, a position not unfamiliar to them, but this year it has a different significance, as that isn't the final bracket. This is a great achievement for Faerieland, and while they may not be able to rise higher, they have already performed well enough to leave the cup with satisfaction. So, on to the final bracket, with Altador in 17th and Moltara in 18th. Altador has certainly been the stronger team during the round robin, and Moltara has yet to score a single Yooyuball win in the entire tournament. It sounds like it should be plain sailing for Altador - but with one important hitch. This match will last for the full 4 days of finals. As they drag on, will Altador falter? And can Moltara capitalise on this? Well, those are my thoughts on the teams. Though, it's important to remember, that what's likely to happen isn't the same as what's possible. Anything can happen, as finals are known for upsets up and down the standings. So all teams should give it their all! June 30, 2010, 6:15 am NST - The results from the final day of the round robin are in, and the brackets for the finals are now set. Most teams were already set in their brackets, making yesterday's results irrelevant to the standings of many, but there were a couple of important matches. 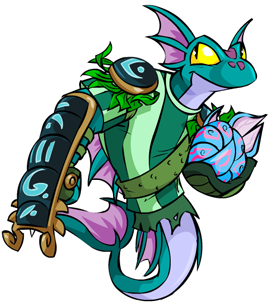 Maraqua, for example, was still fighting for their place in the second bracket with the Haunted Woods. While the Haunted Woods managed a near sweep against their opponents, Brightvale, losing only the Shootout Showdown match, it was not enough. Maraqua pulled off a full sweep against Faerieland and kept their second bracket position. Krawk Island meanwhile managed a good showing against Roo Island. 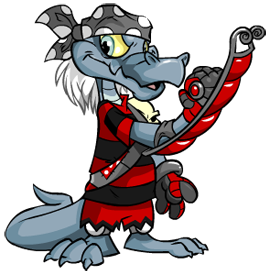 Krawk Island took wins in Yooyuball and Slushie Slinger, but Roo Island took the Shootout Showdown match and a draw in Make Some Noise. This result boosted Krawk Island up above Virtupets in the standings. 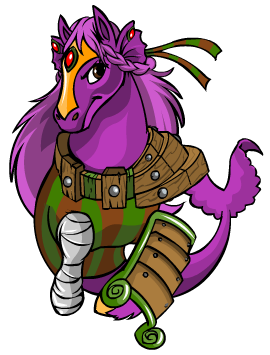 Speaking of Virtupets, they managed a mixed bag of results against the Lost Desert. Make Some Noise and Shootout Showdown went to Virtupets, while the Lost Desert took Yooyuball and drew Slushie Slinger. Kiko Lake ended the round robin in typical style, managing a Slushie Slinger upset against Meridell, while Meridell took all the remaining wins. Kreludor meanwhile faced difficulties against Mystery Island. While all three side games went to Kreludor, the Yooyuball game ended in a draw. In a strange throwback to last year, Kreludor now sit at the top of the standings. Will it be a repeat of last year's finals for them though? Let's hope not. The last team in the top four, the Darigan Citadel, also faced problems yesterday, against Tyrannia. Darigan took a Yooyuball win and a draw in Make Some Noise, but Tyrannia managed Slushie Slinger and Shootout Showdown wins. At the other end of the standings, Moltara blew their final chance for a Yooyuball win in the round robin, suffering a complete sweep at the hands of Shenkuu. Finally, Altador and Terror Mountain faced each other. Altador took Slushie Slinger, Terror Mountain took Make Some Noise and Shootout Showdown, and the Yooyuball match ended in a draw. All teams now have another rest day before the finals begin tomorrow. There have been quite a few close ranked teams this year, so it looks as if the finals may be down to the wire this time around. June 30, 2010, 12:00 am NST - Now that the Round Robin rounds are over, you should probably take a break before the Altador Cup V finals... But how? June 29, 2010, 6:32 am NST - Only two more days of the second round robin to go, can you believe it?? Top begin our results, Team Tyrannia completely defeated Team Faerieland, causing Faerieland to drop to 16th on the standings page. Team Terror Mountain also won themselves a sweep against Team Brightvale. Team Krawk Island achieved a near-sweep against Team Altador, with a draw in Slushie Slinger and wins in every other game. Similar was true for Team Haunted Woods, who defeated Team Shenkuu in all but Make Some Noise, wherein the ninja team held on for a draw. 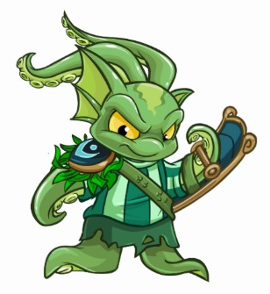 Two teams obtained wins in every game except Slushie Slinger, in which they were defeated by their opponents: Team Virtupets (against Team Maraqua), and Team Kreludor (against Team Kiko Lake). It seems this one win for Kiko Lake was enough to change the standings. Meanwhile, Team Kreludor has regained the top spot on the standings. Team Mystery Island also suffered only one loss against Team Moltara. Their loss, however, was in Make Some Noise rather than Slushie Slinger as was the case above. Team Roo Island and Team Darigan Citadel split the results. 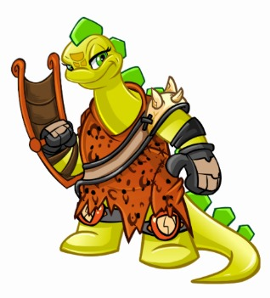 The traditional sides (Make Some Noise and Slushie Slinger) went to the Darigan Team, while Shootout Showdown and the all-important Yooyuball went to Roo Island. Team Lost Desert and Team Meridell also split the results, though less cleanly. Team Lost Desert won Slushie Slinger and Make Some Noise, while Team Meridell won Shootout Showdown. When it came down to the Yooyuball match, however, neither team could get ahead of the other, and the match ended in a draw. June 28, 2010, 4:00 am NST - As we enter the final few days of the round robin stage, there's still a lot to play for in certain brackets. Most shockingly yesterday, Maraqua lost Yooyuball to Kiko Lake. This is a great achievement for the Kiko Lake team, who have so far been sticking to Slushie Slinger upsets. Maraqua fought back with wins in Make Some Noise and Shootout Showdown while drawing Slushie Slinger, though this may prove too little too late, as provided Roo Island does not completely mess up on the two remaining days of play, Maraqua are now essentially out of the running for the top bracket. Another blip was faced by the Haunted Woods against Faerieland, who managed to secure two draws in Slushie Slinger and Make Some Noise, while the Haunted Woods walked away with Yooyuball and Shootout Showdown. In a similar story to Maraqua, the Haunted Woods is now relying on the complete collapse of a team in the second bracket in order to have any chance of moving out of the third bracket. The closest team to the Haunted Woods is Krawk Island, and from today's results, that doesn't seem to be happening. The team managed an almost complete sweep over Brightvale, with wins in Yooyuball, Make Some Noise, and Shootout Showdown. Brightvale forced a draw in Slushie Slinger, but will be disappointed that the match was nothing like the first round, when Brightvale managed to take a win in Slushie Slinger. Outside of a few matches, it was a day of sweeps for many teams. The Lost Desert managed an unsurprising sweep over Altador, while Virtupets did the same over Moltara. Roo Island triumphed over Shenkuu, halting their steady rise, while Tyrannia swept their closely ranked opponents, Mystery Island. In the non-sweep games, Terror Mountain came back on form, winning their Shootout Showdown match against the Darigan Citadel. The Citadel took Yooyuball and Slushie Slinger wins, but Terror Mountain forced a draw in Make Some Noise. Finally, Kreludor faced Meridell, and came out resoundingly on top, narrowly missing out on a full sweep. 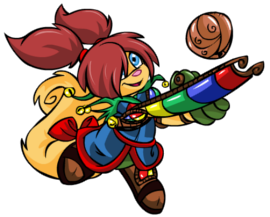 Kreludor took wins in Yooyuball, Slushie Slinger, and Make Some Noise, while the Shootout Showdown match ended in a draw. This marks a change from the first round, when the match went in Meridell's favour. There is only one sweep to report today: Team Lost Desert (2nd) entirely defeated Team Brightvale, weakening again their spot as the 13th place team. It certainly seems the weaker teams are rearranging a lot this year. Team Moltara (18th) played Team Roo Island (4th) yesterday and were unable to manage a single win. They did, however, manage a draw in Slushie Slinger, a game that has become the refuge of the weaker teams this year when playing more powerful opponents. Team Kiko Lake (17th) played Team Shenkuu (10th) with a similar result. The only difference was the fact that Kiko Lake managed a win in Slushie Slinger, rather than a draw. Team Altador (16th) vs. Team Mystery Island (14th) had the same result in Mystery Island's favor--Mystery Island took Yooyuball, Make Some Noise, and Shootout Showdown, while Altador took Slushie Slinger. Team Faerieland (15th) had some trouble against Team Virtupets (8th) but managed nonetheless to claim a draw in Yooyuball despite losing each of the side games to the team from space. Team Terror Mountain (12th) vs. Team Maraqua (7th) followed the pattern of the day (3 wins and a draw or loss). Team Maraqua was on the winning side of the pattern, with the loss in Make Some Noise. It seems those mountain men can truly cheer in their specialty game. Team Tyrannia (11th) actually took the most wins in their match against Team Haunted Woods (9th), though Team Haunted Woods took the overall win with their win in Yooyuball. Tyrannia won Slushie Slinger and Make Some Noise, while Shootout Showdown ended in a draw. Team Krawk Island (9th) were forced to take only two draws in their match against the powerful Team Kreludor (3rd). With Kreludor's wins in Slushie Slinger and Shootout Showdown, Krawk Island was fairly happy with a draw in Make Some Noise and especially in Yooyuball, which made the overall result for the day a draw. The final match of the day was between Team 5th Place and Team 1st Place, for Darigan Citadel seems to have temporarily taken over the spot that has belonged to several different teams this year, recently Team Lost Desert and Team Kreludor. It is certainly a close race for the top spot this year. Their match against Team Meridell ended in split results. Team Darigan Citadel took Slushie Slinger and Make Some Noise, while Team Meridell took the Yooyuball games--Yooyuball and Shootout Showdown. Well, congrats to everyone! Don't forget to check out the TNT Staff Tournament page for voting results for the first two Round 2 matches! Good luck! June 26, 2010, 4:12 am NST - The bitter fight for the second bracket continued yesterday, as Maraqua and the Haunted Woods fought each other. It was Maraqua that came out on top, managing a complete sweep over the Haunted Woods. This pushed Maraqua back up into the second bracket, and the Haunted Woods down into the third. Elsewhere, Terror Mountain was back on form after losing their first Shootout Showdown match of the season to Kiko Lake yesterday. 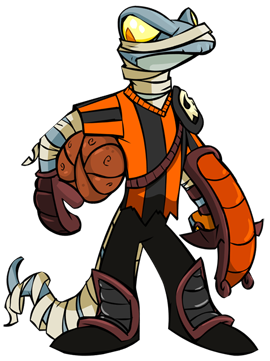 Unfortunately, although Terror Mountain scored the Shootout Showdown win, the Lost Desert was able to take wins in all three remaining games. The Darigan Citadel, currently sitting at the top of the standings, echoed this performance. 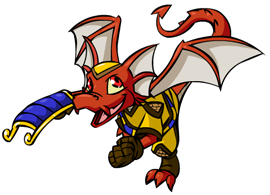 They took wins in Yooyuball, Slushie Slinger, and Make Some Noise, while Virtupets managed a Shootout Showdown win. Roo Island meanwhile continued to cement their place in the top bracket during their match against Kreludor. Roo Island took both Yooyuball and Shootout Showdown wins. 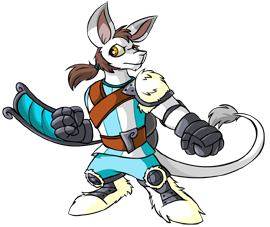 Kreludor however managed to fight back with wins in Slushie Slinger and Make Some Noise. Meridell, who are currently still fighting to regain their top bracket spot, faced problems against Krawk Island. Whilst Meridell managed a Yooyuball win, Krawk Island took wins in all three side games. This is an ever so slightly worse result for Meridell than the first round. Meanwhile, Shenkuu continued their late but steady rise in the third bracket with wins against Mystery Island. Yooyuball, Slushie Slinger, and Make Some Noise went to Shenkuu, while Mystery Island managed a draw in Shootout Showdown. Tyrannia faced Moltara elsewhere, and took wins in Yooyuball, Slushie Slinger and Shootout Showdown. The Tyrannians underestimated Moltara though, and the newcomers fought back to gain a win in Make Some Noise. At the same time, Faerieland finally managed their yearly Yooyuball victory over Altador yesterday, something they were deprived of in the first round. They also took a draw in Shootout Showdown, but Altador managed wins in Slushie Slinger and Make Some Noise. Finally, Kiko Lake and Brightvale clashed, with Brightvale emerging on top. The Yooyuball match itself ended in a draw, but Brightvale took wins in all three side games. In other news, the second round of the TNT Staff Tournament has begun, and the first two results released. Snarkie, the favourite, has been knocked out by Twitterpate in a shock result, while Lawyerbot managed a win over Pie. The remaining two matches will be played on Monday. ...with only one sweep to report! And that sweep is of Faerieland by Darigan Citadel. It seems the faeries were simply unable to withstand the force of such a powerful team yesterday. Team Terror Mountain vs. Team Kiko Lake went almost entirely the same, except for the fact that the Shootout Showdown result was a loss, rather than a draw. Team Maraqua was also plagued by this problem. They easily defeated Team Moltara in Yooyuball, Make Some Noise, and Shootout Showdown, but the Moltarans slung their slushies to a sweep-breaking victory in Slushie Slinger. Team Kreludor's problem was both games. They won Make Some Noise and Yooyuball, meaning they won overall, but they lost both Slushie Slinger and Shootout Showdown to Team Tyrannia. In fact, only two matches were affected by something other than these two games. Team Brightvale defeated Team Mystery Island in Yooyuball and Slushie Slinger, but lost Shootout Showdown. Going into the Make Some Noise game, they expected to win, given the result pattern of the day, but they were defeated. The overall win, however, was enough to push Brightvale ahead of Mystery Island in the standings. The final match of the day was Roo Island vs. Meridell. Roo Island took a win in Shootout Showdown, while Meridell took a win in Make Some Noise to set up the day. The Slushie Slinger match could not be settled, so each team accepted a draw, giving them a 1-1-1 win-draw-loss record going into the Yooyuball match. This, however, also ended in a draw--the first and only draw of the day. Well, that's it for now...don't forget to vote for Round 2 of the TNT Staff Tournament. Back at JN, final tallies are being finished, so look for results coming soon. Good luck today!